Full disclosure: I decided to check out the new animated video game adaptation Ratchet & Clank solely dues to Sylvester Stallone’s presence in the voice cast. I did play one of the games back in the PlayStation 2 days, but not enough to spark an interest in a film. While I understand the recent PS4 reboot has been well received, the film itself should be able to stand on its own legs. Unfortunately, it’s noisy, derivative, and will try many viewers’ patience even at a relatively tight 94 minutes. That said, for a relatively cut-rate animated feature (reportedly $20 million budget) there are plenty of flashy visuals and rambunctious action sequences tailored to please kids. The story centers on Blarg leader Chairman Drek (voiced by Paul Giamatti) and his evil plan to wreak destruction using the Deplanetizer. That’s a space station with the power to obliterate an entire planet. Ever seen anything like that before? 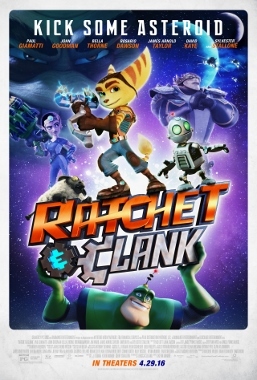 Ratchet (voiced by James Arnold Taylor) is a Lombax (sort of a fox-like creature) who dreams of joining the Galactic Rangers. He’s stuck working for mechanic Gimroth (John Goodman) and in his spare time he races a pod-type vehicle through his planet’s desert canyons. And yes, just like the Death Star—er, Deplanetizer—the podracing sequences are straight out of Star Wars. Galactic Ranger leader Captain Qwark (Jim Ward), kind of a Buzz Lightyear rip-off, announces the search for a fifth team member to assist in stopping the Blarg. 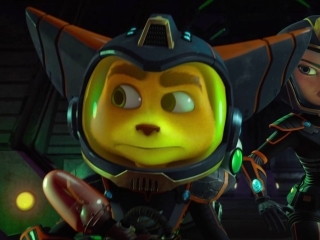 As Ratchet vies for the open spot, he meets the runty robot Clank (David Kaye) who carries information about Drek’s planet-destroying operation. Again, novel idea—a robot carrying vital information about a dangerous space station. As for Stallone, he voices the entirely inconsequential role of Drek’s right-hand robot Victor Von Ion. Stallone has done effective voice work in the past (Antz, Zookeeper) but here he’s given almost nothing to do. Overall Ratchet & Clank will fade from the memory nearly as soon as its mid- and post-credit bonus scenes end. Then again, some of the kids in the audience I saw it with seemed awestruck by the visuals, leading me to conclude that Ratchet & Clank is serviceable kid vid fare.